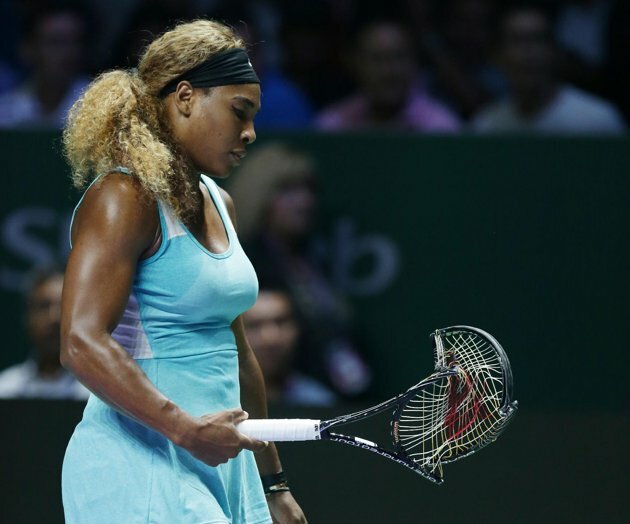 Serena Williams gave a fiery display of her fighting spirit on October 25 at the Singapore Indoor Stadium during her WTA Finals semi-final against good friend Caroline Wozniacki. Serena Williams beat Caroline Wozniacki in a thrilling contest to reach her third consecutive final at the WTA Tour Finals in Singapore. The world No 1 had a 9-1 head-to-head record going into the game against the Dane, but got off to a slow start in the opening set. Her frustration came to a boil when she went 5-2 down after sending the ball into the net. Serena Williams, 33, proceeded to smash her racket multiple times into the ground, leaving it in an obliterated, mangled mess. Her act left the crowd gasping and earned her a warning from the chair umpire. “I don’t know how many times I hit it, but boy, that racket will never do me wrong again, I tell you,” Serena Williams said of her angry outburst in the first set. “It was definitely legendary. I kind of lost my cool a little bit. I thought, well, at least you know I’m passionate. I give 200%. Serena Williams will face a rematch against Simona Halep on October 26, four days after suffering her heaviest defeat in 16 years against the Romanian in the group stage. Simona Halep, 23, broke Agnieszka Radwanska’s serve five times and hit 26 clean winners as she swept past the Pole to reach the final on her first appearance at the WTA season finale.